Any meeting room with a video conferencing system has a passport to the world. Video conferencing connects people from every corner of the globe, allowing them to communicate face-to-face in the virtual world without any real-life travel expenses required. Technology like HD video, wideband audio and user-friendly controls provide any incredible degree of intuitive interaction. Video conferencing systems with content sharing, dual monitor support, multiparty support and noise reduction facilitate even greater collaboration. Some systems go even further by offering PTZ cameras, expandable speakerphones and Skype for Business interoperability. Our firm is counted amongst the significant names, offering a wide range of excellent quality Grandstream GVC3200 Full HD Video Conferencing System. It is a ground-breaking solution that offers small-to-medium businesses a revolutionary video conferencing system with unprecedented flexibility and the power of support for multiple popular video conferencing protocols and platforms right out of the box. Our vendors' only use high grade components and latest technology while manufacturing this system. The offered system is widely appreciated all over the nation for its salient attributes. With our quality range, we are able to maintain a strong foothold in this industry. Technology like Full HD video, wideband audio and user-friendly controls provide any incredible degree of intuitive interaction. Video conferencing systems with content sharing, dual monitor support, multiparty support and noise reduction facilitate even greater collaboration. Some systems go even further by offering PTZ cameras, expandable speakerphones and Skype for Business interoperability. A ground-breaking solution that offers small businesses a revolutionary video conferencing system with unprecedented flexibility and the power of support for multiple popular video conferencing protocols and platforms right out of the box. Create a Powerful, Flexible Telepresence System The Cisco TelePresence SX20 Quick Set is a flexible solution that helps you easily turn any flat panel display into a powerful telepresence system for small to medium-size meeting rooms. The SX20 Quick Set delivers high-definition video quality, multiparty conferencing, and three different camera options to accommodate room size and configurations--all at a value price. 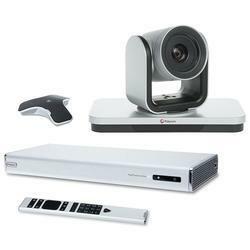 Grandstream GVC32XX provides a budget friendly, all-in-one HD video conferencing solution for business. GVC32XX has an embedded 3-way hybrid-protocol multipoint control unit and a world-class PTZ camera. The camera takes 1080p Full HD video and features 9x lossless optical zoom for picking out faces and a wide-angle lens. The system features built-in Bluetooth for wireless connectivity. GVC32XX supports SIP, so it is interoperable with standards-based SIP video conferencing platforms. Because the operating system is based on Android, you also have access to apps in the Google Play Store. Grandstream GVC32XX's base unit has extensive interface options, including dual HDMI video output for running video or content on dual HD displays. An SD card slot allows you to locally recording conference calls without extra licensing costs. The package includes a Grandstream GAC IP Audio Conference Phone. This Android-based SIP conference phone gives you HD audio quality with voice pick-up out to 12ft. GAC has a 7-way audio conferencing bridge built-in, as well as Bluetooth and WiFi. For an all-in-one solution for professional video conferencing, look to Grandstream GVC32XX. Grandstream GVC3210 gives you more than 4k Ultra HD video and a 4-microphone array with Noise Shield technology. GVC3210 provides an innovative, easy to use solution for video conferencing. Perfect for the huddle room, GVC3210 runs on Android and connects wirelessly via Bluetooth or dual-band WiFi. Connect to a display using HDMI, and connect to your network using Gigabit Ethernet. All this in a single compact device that you can mount on the wall or on a monitor. Grandstream GVC3210 uses a 16 MP CMOS sensor to produce vivid video, up to 4k Ultra HD at 30fps. It supports the highly efficient H.265 (HEVC) video codec to keep your bandwidth free. Share content wirelessly using Miracast. The package includes a remote control for easy operation. Face-to-Face Collaboration in Small Workspaces Use any flat-panel display to add video collaboration to small rooms and huddle paces using the all-in-one Cisco TelePresence SX10 Quick Set. This affordable unit is ideal for small- to medium-sized businesses just starting out with telepresence, or for extending telepresence throughout an enterprise. Now, Spark ready, the SX10 supports cloud registration to Cisco Spark Services for even faster and more cost effective deployment*. Avaya Mini spaces are among the fastest-growing meeting room types today as businesses look to modern collaboration technologies to make better use of their office real estate. The small design — seating up to two people — is ideal when you need a quiet place to make a call. Smaller spaces have smaller budgets and require less complexity, so the technology in the room must be cost-effective and easy to use. Avaya is designed to bring affordable video collaboration to mini spaces without sacrificing consistency and ease of use for users and IT admins. The GVC32XX is a ground-breaking solution that offers small businesses a revolutionary video conferencing system with unprecedented flexibility and the power of support for multiple popular video conferencing protocols and platforms right out of the box. GVC32XX supports Grandstream’s robust IPVideoTalk platform for plug and play video conferencing while also being interoperable with any 3rd party SIP video conferencing platform – thus offering a great option to expand or implement a 3rd party platform. Supports third party SIP video conferencing platforms. Boost your productivity and enhance your relationships with HD video, audio, and web collaboration from Avaya Equinox Meetings Online. Bring the experience of a face—to—face meeting to your employees, customers and partners, anywhere, on nearly any device. Simplify and converge your audio, video, web collaboration, and webcasting to one cloud platform and app. Save money, admin time, and user training by meeting with just one app. Meet with Any Device Meet and stay productive from nearly anywhere with your Windows, macOS, iOS, or Android device; dial—in with your phone in over 35 countries at no extra cost. Frictionless Participation Join directly from your browser without installing an app or plug—in, via WebRTC technology. End—to—end encryption helps make meetings more secure. Room and Huddle System Connectivity Use your H.323 or SIP video room system from Avaya, Cisco, Lifesize, or Polycom in 1080p HD for group participation. Seamless Avaya UC Integration Enjoy a seamless, integrated experience with Avaya Aura®, Avaya IP Office™, and Avaya Equinox on—premises or cloud deployments. Polycom Group 310 video conferencing system supports content sharing through the HDMI port, VGA port and People+Content IP application. License the system for 1080p resolution and it can support full HD video conferences and content sharing. 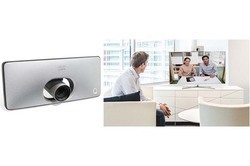 Set up the included codec and EagleEye IV 4x or 12x camera in your small meeting room or huddle space, designed for personal interactions with remote participants. The system is easy to install, configure and use, with more expansion and licensing options available. A 4 time, 10-times optical zoom and 12-times digital zoom ability lets the EagleEye IV 4x or 12x camera magnify objects extremely well, either close up or far away. The camera also features a 4k image sensor so digital zoom does not fully degrade HD images. Use the included remote control to set up, enter and end conference calls with ease. 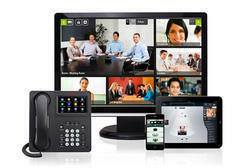 The Polycom Group 310’s codec is interoperable with a wide range of industry standards including H.239, H.264 and SIP.